So many people think when they hear "hernia" that once repair surgery is done a child born with CDH is "fixed." In this post CDH mom, Olivia Bailey Cason, gives information on her child's oral aversion caused by the cascading interventions that save the lives of newborns with CDH. These interventions are an ABSOLUTE necessity, but lead to unintended consequences like a child needing a feeding tube until they can learn to eat effectively or therapies to teach them to eat effectively. Thank you Olivia, for educating our audience! One thing I’m asked a lot is why Kenna is so small and what oral aversions have to do with a diaphragm that didn’t fully form. When Makenna was born she wasn’t given immediate skin to skin, in fact she wasn’t held at all for 28 days. Her mouth was full of tubes (one to breathe and one for suctioning) so she wasn’t allowed to breastfeed or take a bottle. She didn’t find comfort in mouthing things the way babies normally do and instead had numerous negative experiences associated with things going in her mouth. All of her nutrition was given first through her veins (TPN) and then later through a tube in her nose, so she didn’t even experience positive experiences through food. As a result when she finally was able to eat, she didn’t want to. She didn’t trust us to put anything in her mouth. She wouldn’t take a bottle or a pacifier and wouldn’t let us brush her teeth or spoon feed her. Thankfully at a little over 30 days old Makenna attempted to nurse for the first time and succeeded, but it wasn’t easy for her. Her little lungs worked so hard to eat that she would fall asleep after 3-4 minutes every time. Then she’d wake up 20-30 minutes later wanting to eat again, only to fall asleep almost immediately. She didn’t need a gtube at first and by the time we knew she did, she couldn’t have one because she had developed hydrocephalus and the risk of the tube getting infected and the infection going to her brain was too high. This happened 24 hours a day for 21 months straight. For 21 months she wouldn’t take a bottle or a sippy cup, so for 21 months I was the only one who could feed her and she never ate enough to sustain herself away from me for more than an hour. She also never slept more than 30 minutes at a time...which means neither did I. It was rough. At the same time all of this was going on we also discovered that Kenna had allergies. Not just to dairy and soy like many kids, but also to wheat, corn, eggs, apples, carrots, and a few other things. We were forced to remove all of these from her diet and as such she was limited in the foods that she could eat (nothing processed). Fruit and many other foods also made her reflux worse and between food hurting her gut, allergies, and her oral aversions she started to refuse to eat. She then developed sensory issues to foods because she didn’t have experiences with them and started rejecting things based on their textures and the way they felt, smelled, or looked. People go on paleo to lose weight and we were forced to use it with Kenna and myself due to her allergies to corn, dairy, soy, and wheat (because she nursed I couldn’t eat them either and switching to formula wasn’t an option because she wouldn’t take a bottle due to the oral aversions). All that to say...it’s been a journey and it’s still something she struggles with. 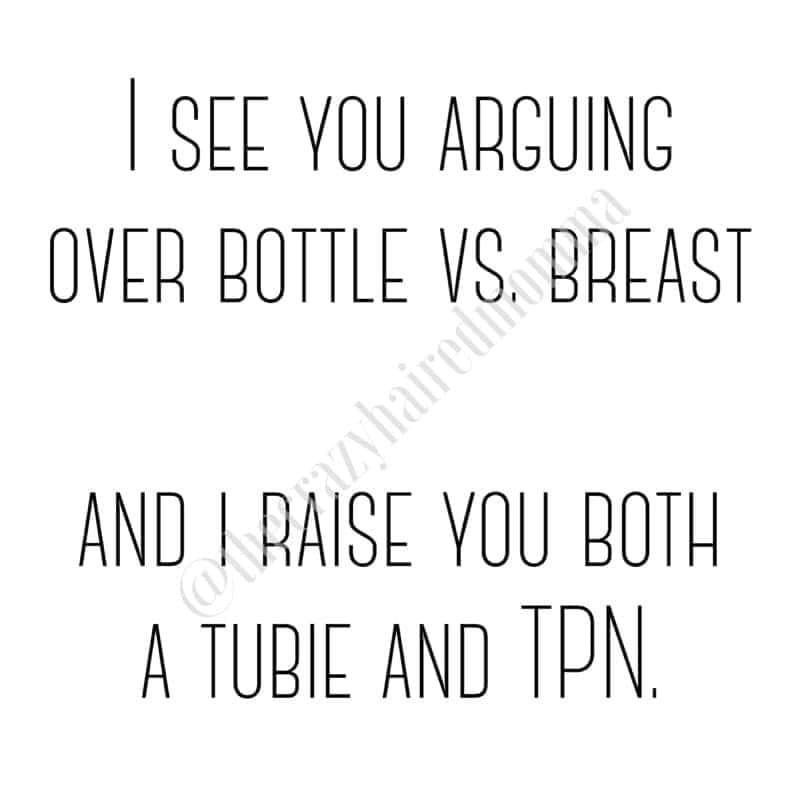 It drives me crazy when I hear the breast vs bottle argument. It is so ridiculous. Be glad your baby eats and you have the ability to feed them. Be glad they gain weight and they eat enough to grow, sleep, and thrive. Fed is best...however that happens and whatever that looks like...don’t feel guilty for feeding your baby. Don’t let others judge decisions they don’t understand. I’m sure people see me allowing Kenna to eat whatever she wants, whenever she wants, and they judge my decision. I’m sure they don’t understand why we would give her medicine to stimulate an appetite or why we obsess over her weight. But until you’ve been in our shoes and walked this walk, you can’t understand how hard we work for every one of those 33 pounds that make up our miracle!